If you are located in Moore, OK and are searching for Couples Therapy and Marriage Counseling services please contact one of our offices today. We are here to help your relationship. Relationships are not always easy. At some point in any relationship couples can expect to run into problems and conflicts. There is hope, however. Many couples in Moore, OK have benefited from couples therapy, and you and your partner can too. No relationship is successful without open communication, compromise, trust, and intimacy. Just because you may be experiencing problems within your relationship does not mean that it is doomed to failure. Marriage Solutions understands this, which is why we try very hard to get to know each of our clients on a personal level so that we can create an open and comfortable environment that promotes healthy and loving relationships. We never blame or criticize you. If you are in Moore, OK and would like to give couples therapy a try, contact us to learn more at 405-237-9697. Good communication about the right things is crucial in a marriage. If you cannot share your needs and wants with each other and discuss issues as they arise, they will build up over time. This will take a toll on your relationship. Bad communication can drive a wedge between you and your spouse. Left unchecked, it can cause you two to grow apart. Poor communication can ruin marriages. Lack of communication can lead to trust issues and this can create much bigger problems down the road. 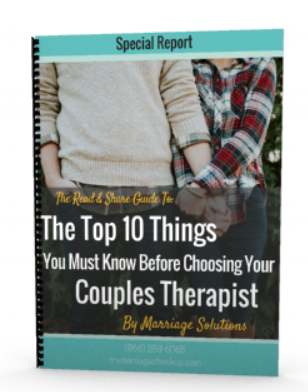 When you begin couples therapy with us at Marriage Solutions, we begin by helping you improve your communication so that you can have a successfully functioning relationship. We will teach you how to communicate about issues or concerns with your spouse in a way that does not attack them or put them on the defensive. Ultimately, you will get what you need. Not trusting your spouse can create issues because this will put distance between the two of you and you may ultimately begin to feel unloved and not cared about. It is a terrible feeling to feel like your spouse is hiding things from you or keeping secrets. When you start to distrust your spouse, this can create a lot of stress and tension in your life, and it will put a strain on your relationship. Our team at Marriage Solutions will help you and your spouse work through your trust issues. Our Moore, OK marriage counseling will help get to the root of where hostility, pain, anxiety, and misunderstandings are coming from. Sometimes we experience trauma in our life that causes us to hide certain things and cover up our emotions. Because we understand this and have a proven track record in rebuilding damaged relationships, we offer one of the top couples therapy programs in Moore. Over time, passions can die down, but they do not need to die out. It is important to remember that it is always possible to rekindle the flame of a relationship, no matter how long you have been together. When a couple is going through a hard time, it is common for communication to suffer, which can lead to arguing and confrontations. You or your spouse may begin to feel unloved and unappreciated, which will cause you both to suffer from a loss of intimacy. When this happens, couples begin to feel like strangers and, unfortunately, this can lead to affairs. Even though you may be experiencing a situation like this right now, understand that it can be fixed. There is hope. Marriage Solutions can offer you and your spouse intensive programs that will help you both remember why you fell in love in the first place so that you can get back on track to a happy and healthy relationship. To learn more about our Moore, OK marriage counseling services, please contact us today at 405-237-9697. With locations in Tulsa and OKC we also serve the Edmond, Norman, Yukon, North OKC and South OKC areas.